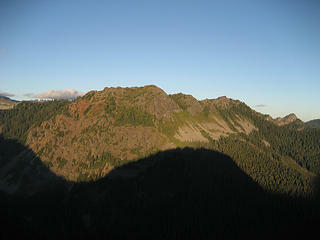 NWHikers.net - View topic - TNAB: Guye(s) Night Out! 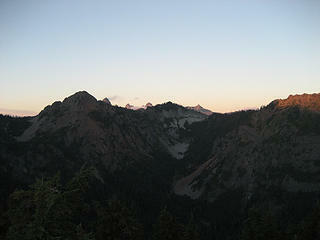 Forum Index > Trip Reports > TNAB: Guye(s) Night Out! Despite fantastic weather and a fun, zippy hike planned, only three "guys" showed up for Guye Peak: Chris S (CHR15), Dave (Tread Well), and Yours Truly. 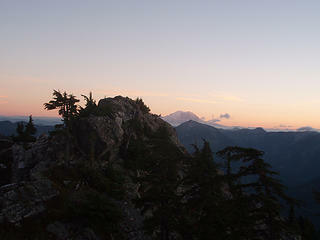 Starting from Alpental at 6 PM, we made quick work of the Snoqualmie Mountain trail. 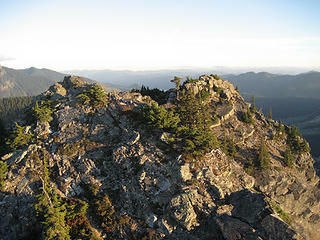 From where the trail splits in the talus field, we took the right fork and meandered eastward to the saddle on Cave Ridge. And after a quick stop to take reflection pics at the tarn, we made the final steep push to Guye's north peak, arriving right around 7 PM. The fun was just starting! 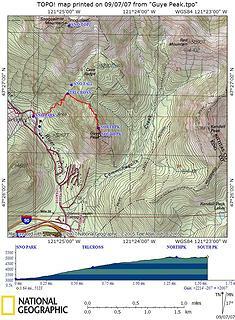 Dave and I took altitude measurements of the north peak, he with his GPS, and I with my altimeter. The sub goal was to see which peak of the three is higher, and by how much. Initial readings made, we backed down to the base of the north peak and descended the steep gully that falls into Commonwealth Basin. 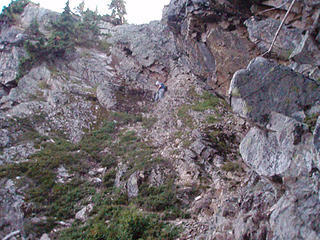 One only needs to drop about 100 ft of el before the passage to Guye's middle peak is revealed. 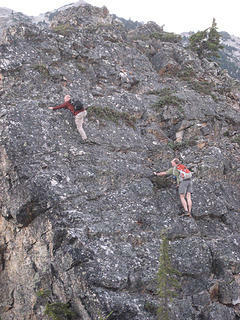 It first requires a ledge traverse, then ascend the opposite gully. Midway up this gully is a slabby portion with just enough sketch factor to warrant use of a rope for a handline, especially on the descent. 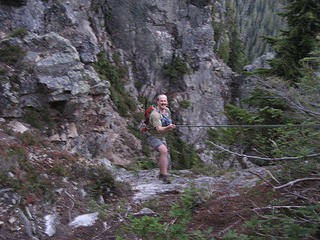 I scrambled to the belay station and attached a 30m length. 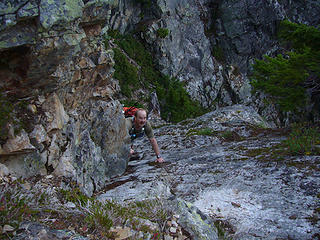 Overall, the middle peak is probably the most enjoyable, which much sustained scrambling. 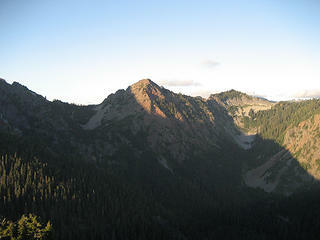 The drop to the saddle between the middle and south peaks has a nice bit of exposure to keep one's attention. Not so much to scramble on the south peak, but the views are incredible! 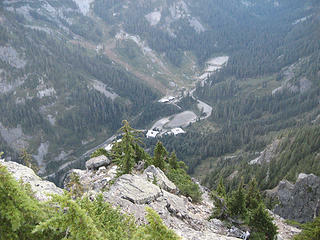 Off to the right, you can stare straight down on Alpental. The Commonwealth Basin and all its peaks are in view. 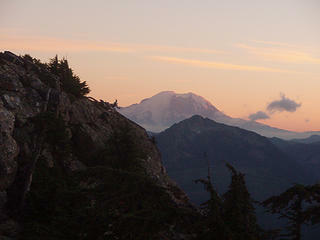 But for me, the best is watching the sun set on Rainier - I never get tired of that! It was 7:30 PM by now. My altimeter read 10 ft higher than the north peak, while Dave's GPS still refused to budge. What to make of that! I made a quick call to Yet, to let her join in on the fun (we missed you! ), then we turned around to head home. 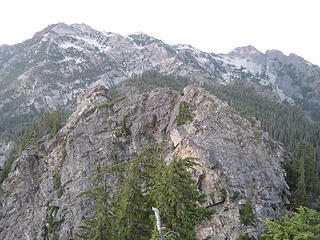 Wouldn't be prudent to get stuck scrambling in the dark! We made our way off the peaks and back to the trail without difficulty. The rope was just the right length to deliver us to safety. 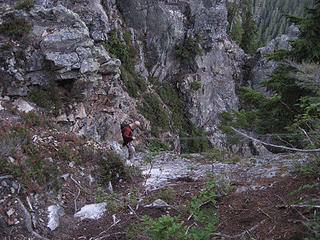 Down-hiking in the twilight, we passed the Cave Ridge saddle, only to joined by...The Phantom! Too funny, I was wondering where Steve was - hehe. He spun his usual tale of a late start and a wrong turn - sounded like he had as much fun as we did! The four of us proceeded to descend from the mountain, and then headed straight for the NBB&G. What else did you expect? Mark, the combination of your persistent nickname and my nice visit with the State Patrol on the way home made me realize that a change is necessary for my NWHikers handle. Byebye CHR15. Which of 3 peaks is higher? That Phantom dude is too funny! Sounds like you guy(e)s had fun measuring the peaks. And there was rope involved, too? Nice! Thanks for the summit call. You guys sure know how to make a girl feel loved. Wow. Really sorry my foot wasn't in shape for this one. Plus my stupid cabin homeowner's Board meeting was last night so I had a double whammy. 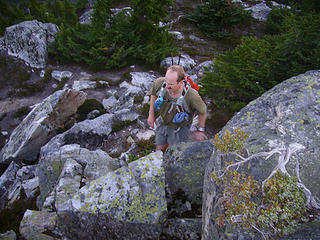 Looks like Tread Well was really concentrating on the Guye middle peak ascent. Perhaps even nervous? I haven't done Guye. And you guys used a rope too. I haven't done a hike which required a rope - now I'm really bummed I missed out. Plus the Phantom appears again!! Magnum. I like it! I never could type that danged nickname of yours. You know, with three guys and three summits, maybe you could have used a different methodology. In the spirit of guys' night out, you could have each gone to a separate summit, and then compared whose was bigger. Looks like some fun scrambling. 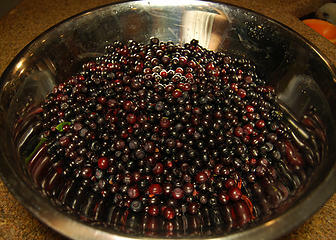 I have never done Guye in the summer, only in the snow. 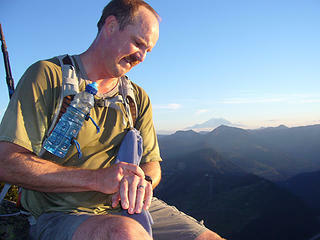 Well seeing as I am on intimate terms with the Kittatass Co. Bulls after TNAB hikes I can well understand the situation. Sorry to have missed out on this one, FWIW I did replace the geocache container on DH earlier on Thursday. Help me out with this one. Peggy Goldmans 75 Scrambles, does it mention anything about rope work? I don't seem to recall. All the reseach that I've done since, everyone seems to at least belay back to the gullly. BTW thanks for the TR guyes. nor side mirrored lakes where awe so speaks. 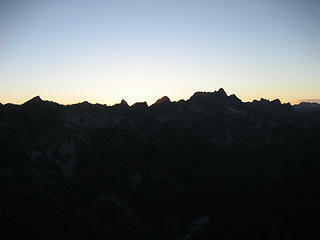 Blanketed valleys the dawn awakes and blinking stars to fade. My soul is called to see these things, the Hand of God has made. 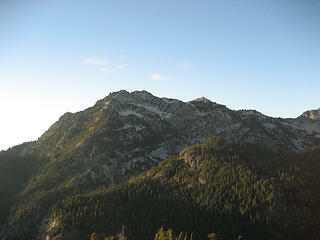 South Guye Peak, how do we get there? Dave, I'm wondering if we know the same Mark and Chris? I enjoyed (am enjoying) all the pics posted here. You -especially- seem to have had a blast! 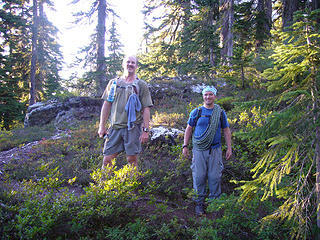 Love the classic "this is how we get there/typical TNAB trail." 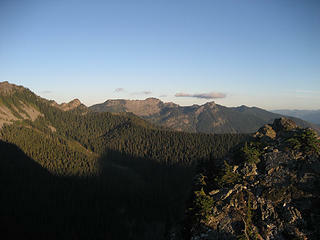 Well seeing as I am on intimate terms with the Kittatass Co. Bulls after TNAB hikes I can well understand the situation. 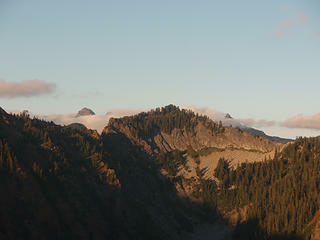 Oren, the section between the north and middle peaks is a bit sketchy, especially when hiking TNAB-style. It's slabby, dirty, and slopes the wrong way. A belay station is already setup on a clump of trees above it. 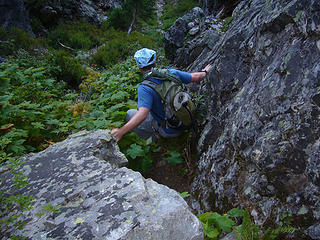 We used the rope only for a handline, and mostly for the downclimb, nothing more "technical" than that. 30m suffices quite nicely.